It’s the holidays! The time of year for families to gather together to celebrate traditions, share memories, and make new ones. This year, as you surround yourself with family and friends, both two-legged and four-legged alike, remember there are millions of dogs in shelters, patiently waiting for a family of their own. For some, this won’t be their first, second, or even their third Christmas behind bars. It’s our Christmas wish that every dog in rescue would find a home for the holidays, so we’ve selected 12 special dogs from around the country that have been overlooked time and time again. Some are senior dogs, some have special needs, and some are passed over for reasons we simply can’t understand – but, they all deserve to spend the holidays with a family of their own. We’re calling this the 12 Dogs of Christmas. The Dogington Post along with our friends at Wellness have joined forces to introduce you to 12 needy dogs in hopes that they’ll finally get noticed…and maybe get a home for the holidays! Aspen is a 2-and-a-half to 3-year old Great Dane who was rescued from the brink of death by the amazing folks at Great Babies Rescue in Orleans, Indiana more than a year ago. Great Babies Rescue were contacted by a couple who had recently had a new baby and claimed that their Great Dane, Aspen, had stopped eating as a result. 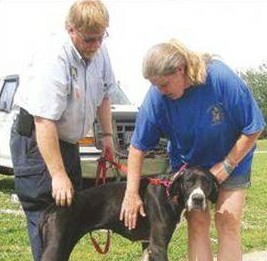 Aspen’s owners sent the rescue photos of a beautiful, healthy merle Great Dane. But, when volunteers arrived to pick her up, instead of the healthy, happy Dane from the photo, they found Aspen emaciated, barely clinging to life, and partially frozen to the ground outside. Unsure if she would even survive the night, Great Babies stepped up to save this beautiful girl. With lots of love, patience, good food, and a warm place to rest her head, Aspen is doing amazingly well today – she just needs a family that will love her and treat her the way she deserves. Special Considerations:Aspen needs a home that has patience and understanding of where she has come from. Aspen can, understandably, be slow to warm up to new situations. According to Great Babies Rescue, Aspen gets along well with the cats that are on the property as well as most of the other dogs but she is the “Queen of her Castle.” Aspen does best in a home without small children because of their fast unpredictable movements and because she doesn’t know her own size. Aspen can be very rambunctious as she still acts like a puppy. Aspen, with her best friend, Mermaid. The Perfect Family For Aspen: Aspen’s perfect Family would be one where she is treated as family and not just a dog. A home with someone who understands the Great Dane Breed. Aspen does get along well with other dogs when introduced appropriately and has even become quite attached to another rescue at Great Babies, Mermaid. The absolute perfect home would be one that could give a home to both Aspen and her best friend, Mermaid. Aspen will soon face her second Christmas without a family. 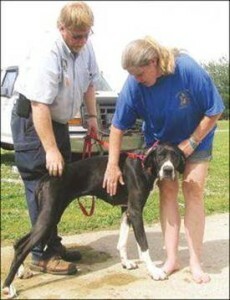 GreatBabies Rescue doing great things . . . .
• Thu, Jun 06, 2013 When Great Babies Rescue, a dog rescue located just southwest of Orleans, benefitted from a generous donation of pet food, the organization decided to pay it forward. The food, several skids of it, came to Great Babies from the Breeders Assistance Program Breed Rescue, which is part of the Cat Fanciers Food Pantry. The late John Bierre, who had been the chairman of the pantry, had a vision to use a 97,000-pound donation from the Royal Canin pet food company to launch a program nationwide called Cats Helping Dogs. “This is amazing,” said Terry Holzheimer of Great Babies. “I was just blessed that God put us in their path.“ The shipment is a big help to the rescue, which goes through 150 pounds of food per day. However, it’s going to make other positive impacts, too. “Somebody’s helping us, and we’re able to help other people in need in this area,” Terry explained. Going to the Orange County Humane Society was 767 pounds of the food. “It’s a good thing, definitely,” said Manager Nikki Childers. “We run off of donations. If we don’t get donations like these, we would never be able to stay open.” Other beneficiaries included the Boxer Babies rescue in Crawford County, Red Sky Rescue in Scott County and a shelter on Long Island in New York. Even individual local pet owners that could use a helping hand are being encouraged to contact the group for help. 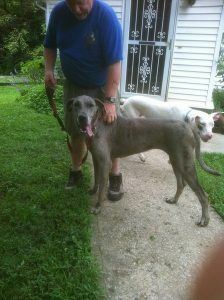 Great Babies can be reached at 502-751-2338 or via email at greatbabiesrescue@yahoo.com . What’s most exciting to Terry is that the food deliveries could become a regular happening. She pointed out that the pantry has indicated it might make quarterly deliveries, as long as there are animals in need. Great Babies Rescue is now home to several dogs that have been rescued from all over the United States. Many are special-needs animals that have severe health problems or were badly abused. The crew at Great Babies works with the dogs for at least six months to help them recover and get them ready to go to good homes. Adoptions are made through an application process. Great care is put into matching dogs with would-be owners by considering factors such as temperament and energy levels. Also to ensure that the animals are ready for their new owners, the Holzheimer family uses a rotating schedule to bring all of the dogs into their home. Although the operation started with great danes and boxers in mind, many other types of dogs have been helped through the years. At one point, the facility was home to more than 30 Boston terriers. “We do what God sends,” Terry explained. “Most of the dogs would be dead if they weren’t here.” Backing up her words, she noted that one of the dogs rescued, a great dane named Serenity, was picked up just 20 minutes before she was due to be euthanized. “Twenty minutes away from dead,” Terry commented. “She is always smiling.” Terry, her husband, Bryan, their family and other volunteers brought Great Babies Rescue to its present location in 2008. “It’s just grown leaps and bounds,” Bryan reported. Donations of money, food and time are what makes it all possible. “We are always looking for volunteers,” Terry shared. One of the people who lends a hand at the facility is Dee Endicott, who explained that she was put in touch with Great Babies by Dr. Brad Cooper following the death of her own beloved boxer. She’s been helping out ever since. With help, Terry wants the facility to grow even more on the eight-acre site and evolve into a full-fledged sanctuary. “I couldn’t imagine not doing it,” she said of the rescue. “They’re my family; they just have four legs.